Elephants hate cats! Whenever they encounter any large predator they get very agitated. It is a great spectacle for Thanda Safari guests to hear the trumpeting and observe the wild chases after such a meeting. 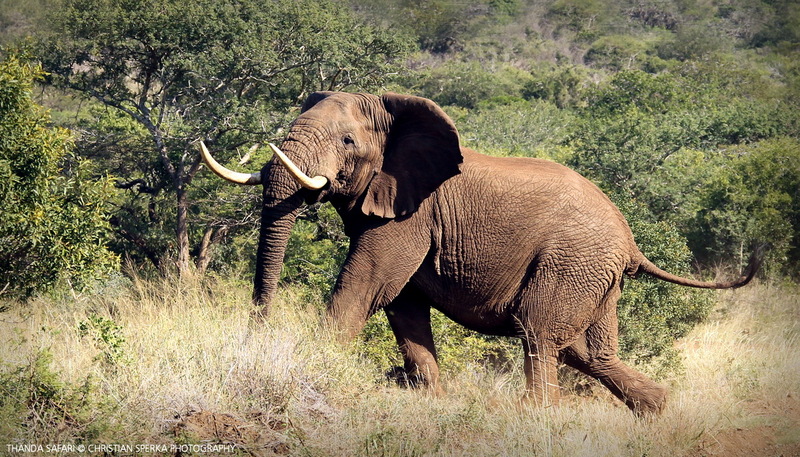 This is one of Thanda’s largest Elephant bulls trailing the herd in such a chase. As he ran across the road he only gave the game viewing vehicle a quick glance before smashing through the thick bush. More about … African Elephants are the largest living land mammals. They cannot canter, but they can walk/amble up to 20kph (13 mph). Their trunks serve as noses, as hands and as a tools for gathering food, siphoning water, dusting and digging. Elephants can swim well, they use their trunks as snorkels in deep water. The intestines of an Elephant may be as much as 35 meters (115″) in length. In a day, they can drink up to 200 liters (53 gallons) of water and a large bull will eat up to 300 kg per day (600 pounds).